2017 is ISO’s 70th anniversary! 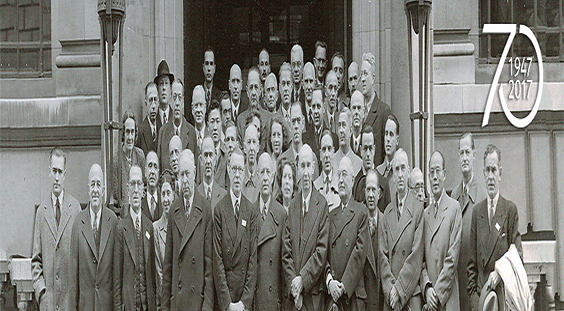 The ISO story began in 1946 when delegates from 25 countries gathered in London to discuss the future of standardization. A year later, on 23 February 1947, ISO officially came into existence. In this post-war era, the founding members saw International Standards as a key to the world’s reconstruction efforts. “For the past 70 years, ISO has developed standards that drive industrial progress, promote global commerce and improve health, safety and the environment. But this is just the beginning”, says Dr Zhang. “The ISO community has many standards that can help organizations and companies address this agenda, ” says the ISO President. “We are ready to provide efficient tools to help the different communities worldwide face up to these challenges and shape a better world.” The future of standardization is promising.